This modern suburban home located in Melbourne, Australia, has been recently completed by Taylor Knights. Set on a steep & bushy site in the heights of Coonan?s Hill, Pascoe Vale South, our clients are bidding farewell to their tired sprawling suburban home to pursue a new and more environmentally considerate home within a smaller footprint. In the existing single storey home to date, city views have only been apparent from the occasional risqué ladder venture. A key part of our client?s brief was to bring this cityscape into their daily lives, where the fundamentals of eat, sleep & play can all be enjoyed from the first floor. Our clients, a young couple and their two beloved pooches, have a love for raw materials expressed in their truest form. With sustainable design integral to the brief, our clients ?must-haves? include; on-site energy storage and provision for their future electric car. Key to our approach has also been to design a robust & low maintenance home. 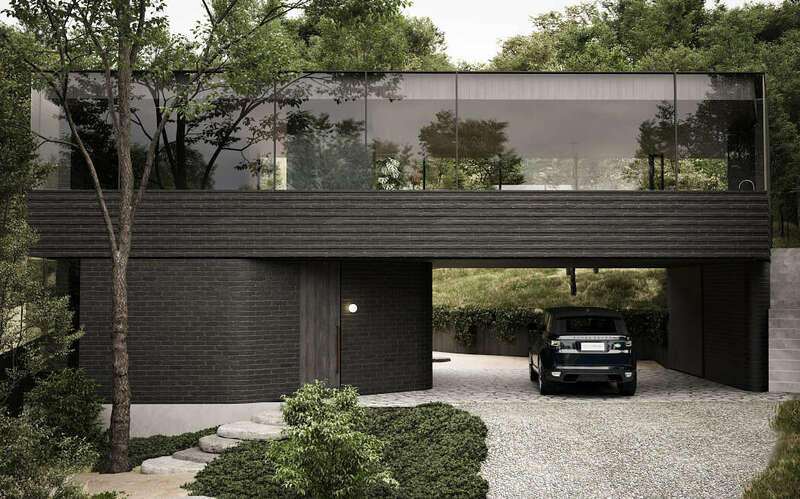 The home itself will be nestled in the centre of the site, with vast garden views to either side. Two robust and gently curving masonry structures occupy the ground plane, bridged together by a minimal first floor volume. This approach was adopted to free up the ground plane and to pay tribute to the established and emerging garden.